← Guess Who Was in The Audience? in the Los Feliz area. Artist and Illustrator Nathan Anderson has created a really cool stylized mural of L.A.’s great writer and poet Charles Bukowski. It’s in the Los Feliz area, at Kingswell and Vermont, on the sidestreet wall of Co-Op. 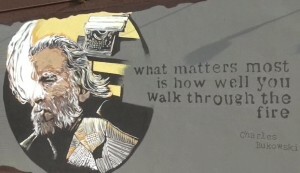 The artist just so happens to be a big fan of Bukowski. Walk up Vermont a block to Skylight Books, they always stock Bukowski’s fiction and poetry. This entry was posted in Books, Hollywood People and tagged artist, Bars, Charles Bukowski, Fiction, Hollywood, Los Angeles, Nathan Anderson, Poet, video, writer. Bookmark the permalink.